Skull Caps to the current British standards must be worn at all times. Body protectors may be worn and are strongly recommended. The judge’s decision in all classes is final BUT objections can be lodged with a £20 deposit to the Secretary within 15 minutes of the Class closing. It is the responsibility of competitors to ensure they get to their class on time. An update is available from the Secretary’s tent. already qualified, will qualify for Equifest 2018. TSR Showing Finals – This show is a qualifier for the 2018 TSR Showing Finals. Qualify and enter ANY of the Finals Central, East Anglia, North West, North East, South East, South, Wales & South West or Scottish. You Do Not have to be a TSR member to qualify or enter a final. 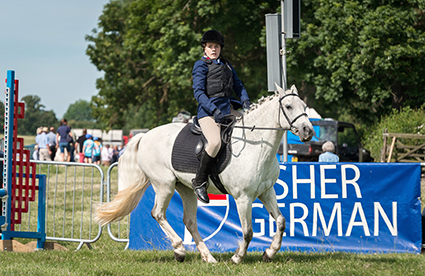 The Rider/Handler qualifies and can enter any horse/pony in any number of Finals! TSR Riders Finals – 1st & 2nd qualify and will receive qualification cards in the ring. TSR Medal Awards – TSR members can collect qualification cards and signatures and redeem for a TSR Medal. See TSR website for details. Maximum height 65cm. Time limit of 2 minutes allowed in the first section of the course. The second section of the course will be timed. No jump off. Winner to receive the Blaston Novice Cup. Maximum height 75cm. Time limit of 2 minutes allowed in the first section of the course. The second section will be timed. No jump off. Winner to receive the Blaston Show Grand Prix Cup. Maximum height 85cm. Time limit of 2 minutes allowed for the course. After the first fence take your own line. Each fence may ONLY be jumped TWICE. The JOKER FENCE is worth 150 points and can only be jumped ONCE. If it is knocked down those points will be deducted from the final score. In the event of a tie the prize will be split. Winner to receive the Blaston Show Accumulator Cup. PLEASE NOTE. Horses/ ponies may only enter ONCE in any one competition. This class is open to everyone with or without a pony. Mounted competitors must wear a hard hat. The Winner of classes 4-8 will receive a £5 gift voucher from Horsewear house Kibworth. Open to horses and ponies of any height and riders of any age and judged 100% on turnout. The winner to receive the Blaston Show Plaque. Open to riders 10 years and under and ponies 127 centimetres (12.2 hh) and under, to be ridden in a snaffle bit with lead rein on noseband and judged on suitability of pony. The winner to receive the Perpetual Challenge Bowl. Open to riders 12 years and under and ponies 137 centimetres (13.2 hh) and under, ridden in snaffle bridle and judged on suitability of pony. Cantering optional. The winner to receive the R. T. Challenge Cup. Open to riders of any age and to ponies not exceeding 153 cm. (15 hh) . Judged on a combination of performance, manners and type. The winner to receive the Novery Kirnel Perpetual Challenge Shield. Open to all thoroughbreds unraced and raced 4 years and over that have been ‘in training’ and are registered with Wetherbys. Class to be judged on turnout, manners, way of going, performance and conformation. The winner to receive the ‘John’ Trophy. The winner to receive the Fernie Pony Club Cup. Open to horses and ponies of any height over 15 years of age. The winner to receive the Storm Challenge Shield. Open to riders 45 years of age and over and to horse and ponies. To be judged on turnout and individual show only. The winner to receive The Jay Dawson Challenge Cup. 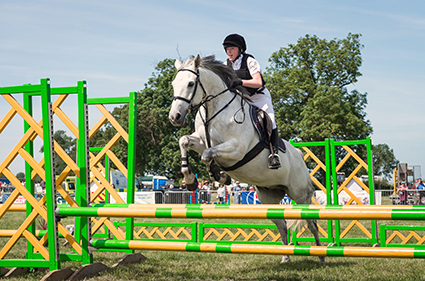 Open to riders of any age and to skewbald and piebald horses and ponies of any height. The winner to receive the Henry Tate Challenge Cup. Open to riders of any age and to horses and ponies over 15 years of age of any height. The winner to receive the Falcon Hotel Challenge Cup. Open to riders of any age and to horses and ponies. This course will be very small with the aim of encouraging riders to get round happily. All competitors jumping a clear round will receive a rosette. (No limit to the number of times competitors may enter). Entry fee: £2.50 to be paid at the ringside. To be judged on performance only. Rosettes for all competitors. 12.30pm – 1.30pm The class is ONLY open to members of a current RDA Group. 1.30pm onwards The class is open to non RDA members. Open to riders of any age. All competitors with clear rounds will receive a rosette. No limit to the number of times competitors may enter. Entry fee: £8.00 for the 4 classes to be paid at the ringside. Lead rein any age OR 10 years and under off the lead rein. Open to horses and ponies one, two and three years old. To be judged on conformation and turnout. The winner to receive The Overstone Perpetual Challenge Cup. Open ridden hunter, mare or gelding, 4 years old and over, exceeding 153 cms. (15.0 hh). Rider any age. The winner to receive the Blaston Show Challenge Cup. Open ridden cob, mare or gelding, 4 years old and over exceeding 148cms. (14.2 hh), but not exceeding 155 cms. (15.1 hh) Riders any age. The winner to receive the Members Trophy. Open riding horse, mare or gelding, 4 years old and over, any height. Rider any age. The winner to receive the Ernest Harrison Challenge Cup. For ponies 148cm (14.2 hh and under). Fences will not exceed 76cms (2ft 6inches). The highest placed pony that has been hunted in the Fernie or Cottesmore countries in the last season will receive the Huntsman Trophy. Sponsored by Ashley Farm Shop. The winner to receive the Fernie Feeds Working Hunter Pony Cup. 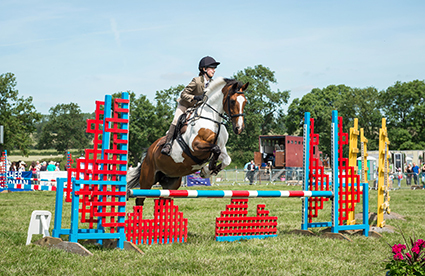 For horses over 148cms (14.2hh) Fences will not exceed 83cms (2ft 9inches). The highest placed horse that has been hunted in the Fernie or Cottesmore countries in the last season will receive the Huntsman Trophy. Sponsored by Town and Country Veterinary Centre, Market Harborough. The winner to receive the Blaston Show Working Hunter Champion Plate. Open to In Hand Heavy Horses – Shire, Clydesdale, Suffolk Punch, Percheron. Stallion, mare, gelding, colt or filly any age. 1st £25 2nd £15 3rd £10 Rosettes for all competitors. Sponsored by Sarah Harris – Veterinary Physiotherapist. The winner to receive The Gamesmaster Trophy. Open to in hand Mountain and Moorland ponies registered with their respective pure bred societies of Connemara, Dales, Dartmoor, Exmoor, Fell, Highland, New Forest, Shetland, Welsh A B C and D. Stallion, mare, colt, filly or gelding, any age. The winner to receive the Balleroy Cragsman Trophy. Open to Mountain and Moorland ponies registered with their respective pure bred societies of Connemara, Dales , Dartmoor, Exmoor, Fell, Highland, New Forest, Shetland, Welsh A B C and D. Stallion, mare or gelding 4 years old and over. Rider any age. The winner to receive the Blaston Show Mountain and Moorland Cup. Please ensure you read our Entry Rules before Applying.